ANONIMO wrote this story and was read by 213 people. For free. (Express)European Commission President Jean Claude Juncker was the latest EU bigwig to be photographed "giving the code" after he was snapped with his hands in the rhombus shape - known as a Merkel Diamond - while talking to Queen Mathilde of Belgium and King Philippe of Belgium during the Te Deum mass at the Cathedral of St. Michael and St. Gudula in Brussels, Belgium. It comes after new British Prime Minster Theresa May was pictured separately making the same hand gesture. German chancellor Angela Merkel has been snapped so many times making the shape, which involves pressing the thumbs and index fingers together to create a diamond, that her name was added to its official description. Mrs May was snapped imitating the 'Merkel diamond' while giving a speech outside the Palace of Westminster on July 11. Conspiracy theory website illuminatiRex lists the diamond sign as number one out of a top-ten of illuminati signs, with Mrs Merkel given her own section for doing it in reverse, in what it describes as the Merkel Raute. And on the conspiracy theory forum run by David Icke, the significance of the Merkel Diamond, which has been used in political poster campaigns, has been discussed. 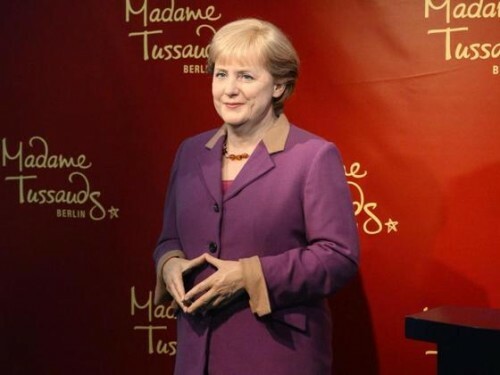 A senior forum member with the user name Posidon posted: "I don't know if any one even notice the Angela Merkel famous hand sign?